After three pregnancies, my regular shoe size went up half a size to 9.5. 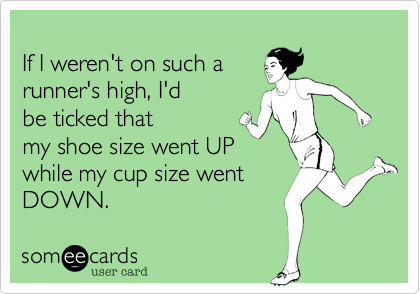 When I bought my first pair of running shoes, they were a size 10.5. Then the manufacturer changed the model for the new year and I needed a — gasp — 11. As I trained for my first triathlons and half marathon, I lost 17 pounds and with those, lost one full bra cup size! Ladies, can any of you relate?